Scuba Diving Costa Rica the is most exciting during the rainy season which runs from June through to December as this is when the level of nutrients in the water swells and vast numbers of hammerheads as well as other marine life is attracted to the region. The waters around Costa Rica are a Marine National Park and care should be taken when scuba diving to ensure that no damage occurs to the marine environment. 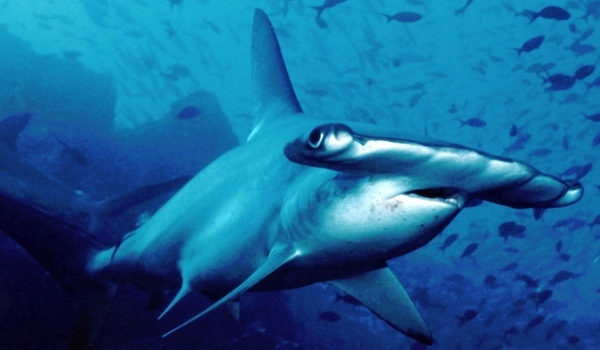 The scalloped hammerheads are the big draw for divers however white tip reef sharks, tiger and guitar sharks are also to be found in the region along with a variety of rays. If you are looking to take advantage of the calmer seas, you visits should be planned between December and May when the waters are a little calmer. Costa Rica lies in a region that is prone to changeable weather due to its location close to the equator. When is the best time to go Scuba diving Costa Rica? The dry season here lasts from November through to May though it can be quite windy during this time. June through to November is the rainy season, this is the time when the Bull sharks can be seen around the Bat Islands. Visibility is not hindered by the rains which makes it a great time to go scuba diving Costa Rica. Protection: 3mm wetsuit from December – April: 3mm Shorty for rest of the year. Average Visibility: 6-35 metres depending on the site, approximately 15 metres general average. Dive Types: Caves, walls, canyons and rocky pinnacles. Bajo Alcyone: Rated as the number one dive site on the island and the place to go to see hundreds of hammerhead sharks, rays and other big fish. Dirty Rock: More suited to the less advanced diver, boulders and pinnacles offer shelter from the currents and at the centre of the hammerhead activity that the waters here are famous for. You may even find yourself swimming with a whale shark as he heads to one of the cleaning stations. Everest: Considered to be one of the highlights of any diving trip to Costa Rica, this is a dive site where you need the use of a deep water submersible to reach depths of around 90 metres. Through your submerged bubble, you will be able to view graceful rays and schools of hammerhead sharks swimming overhead, silhouetted against the blue ocean depths, plus all of the other weird and wonderful marine life that makes its home around this vast underwater mountain. Read more about: Scuba diving Costa Rica and what you can expect to find below the surface. Juan Santa Maria International Airport, commonly referred to as San Jose Costa Rica airport welcomes the majority of international airlines, so it is unlikely that you would have to arrange connecting flights from anywhere, the other airport being Daniel Oduber Airport, located in Liberia, Guanacaste. No visa is required for entry into Costa Rica only a valid passport. Travel to Costa Rica is possible by land, air or sea which leaves you plenty of scopes when considering your travel arrangements. For those looking to hire transport while they are here a 4WD vehicle, is recommended best to cope with the terrain. A great resource for information about traveling in Costa Rica is Anywhere Costa Rica We used their service multiple times when traveling this awesome country and happily recommended them. Scuba diving Costa Rica is booming. For those who love everything about the great outdoors Costa Rica is packed with pristine reefs, rain forests and wildlife above and below the surface. The landscape is at once recognizable as the setting for the Jurassic Park Movies with much of the landscape of the islands being untouched and undisturbed by man’s progress and development. The biodiversity in this country is remarkable considering its size, not only on land, but also beneath the waves. Scuba diving has increased in popularity in Costa Rica, and it now offers world class diving. Visitors will find that there are more scuba dive operators available on the eastern side long the cooler Pacific coast than on the warmer, more tropical Caribbean coast. However, the Caribbean waters offer divers much more of a visual treat. Want to dive in Costa Rica? Deep Blue Diving is the first 5* dive resort located on the main street of Playas del Coco on the Gulf of Papagayo.